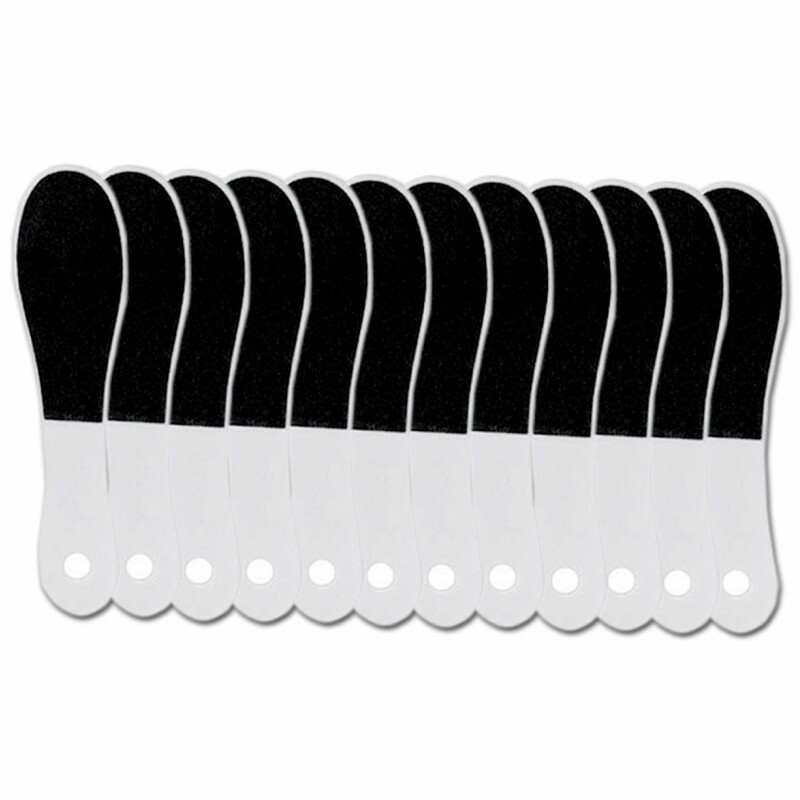 12 pieces of double sided pedicure foot file to take care of your feet. Before you apply a foot file to your skin for smoothing purposes, it's best to prep your feet so you don't have to use excessive force or friction to remove the dry skin. By filling up your tub with a few inches of warm--not hot--water, you can soak your feet for 10 to 15 minutes before filing. This helps to soften hardened skin from callouses so it's more easily removed with the file. If you aren't able to soak your feet, you can try wrapping your feet in a lukewarm, wet washcloth for the same results. Once your feet are soaked and ready, it's time to apply the file. When filing the skin on your feet, start with the thickest skin. This is often the skin on the heel, the pig toe, or along the side of the big toe. Tackle the thickest areas first and then reassess the need for filing on other areas of the foot. When filing, do so in a back-and-forth motion. Filing should never hurt, so stop if it starts to sting or break the skin. You only want to lightly remove the thick, dead skin from the surface of the foot, so avoid marring the healthy skin that you reveal through the process. Once you're done filing your feet with the foot file, add a good-quality moisturizer to your feet and rub in to allow your feet to absorb the moisture. This helps soften the skin and protect the new skin revealed through the filing process. Repeat the process as often as needed or once per week so you always have sandal-ready smooth feet.